1915Jan . 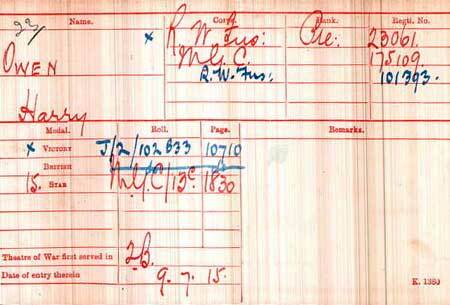 His number indicates at this when he enlisted, and believed to be a 8th Bn man at Gallipoli. The number is a Regular number not a TF one. 1915 Jul 9. Lands in Gallipoli . 1/5, 1/6 and 1/7 RWF. Moved immediately on mobilisation to Conway and on to Northampton. Moved to Cambridge in December 1914 and Bedford in May 1915. 13 May 1915 : formation became 158th Brigade, 53rd Welsh) Division. 1915 Dec . evacuated from Gallipoli and moved to Egypt.